At Just Grillin Outdoor Living, your investment in a project is something we take serious here. That’s why we use our own in-house team of licensed, insured and skilled designers plus craftsman to assure quality standards are exceeded and you get a return on enjoyment from your project. When building with us, we have a proven process to make this the most enjoyable experience with a contractor that you’d ever have! When you’re ready to put a project in motion, this is your first step. Get in touch with us and our team will schedule a one-hour in-home professional consultation. Our consultations start at a rate of $250 and go up based on your distance from our showroom. That rate must be paid in advance of a consultation and is credited back to projects Just Grillin Outdoor Living completes. For that rate, you are getting our professional site survey which is detailed in the next step. Your dedicated Outdoor Living Specialist will arrive on time and ready to survey your project area. They will be taking measurements, pictures, evaluating your space and asking a lot of questions. Be prepared to answer questions about your budget, design style, electricity, expectations, gas lines, HOA, lifestyle, plumbing, must-have features and any other information that might be vital to your project. 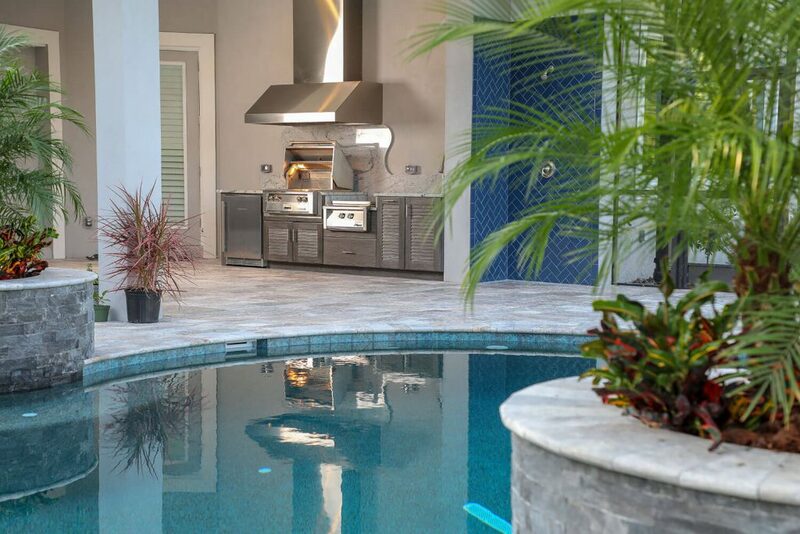 Your dedicated Outdoor Living Specialist will schedule an in-person presentation at Just Grillin Outdoor Living’s showroom at the end of the initial visit. This presentation is when your Outdoor Living Specialist will introduce you to your project. You will explore the ins and out in a 3D presentation. You’ll then be presented with an exact quote for the scope of work. What this means is there would not be any surprise expenses throughout the course of your project contrary to how many other contractors run their business. Once contracted with Just Grillin Outdoor Living, this is the first action our team takes. Depending on where you live, some areas require permit or HOA approval. Our team will handle pulling all necessary permits, inspections and gaining approval. Our project manager will need a copy of your lot survey. Our crews are working on several projects at a time. There are a few factors to keep in mind here. Our team does its best to keep production continuous but there can be lag between certain phases of a project. Due to that, we highly encourage decisions on materials such as stone finishes and countertops be made in a timely manner once contracting with Just Grillin Outdoor Living. Certain materials are readily available while others might have a longer lead time based on the selection. This way our team has the materials available for certain phases of a project when its time to move to that phase. Our team is comprised of skilled craftsman that excel in certain areas. Throughout projects, at times, you will see new faces on the jobsite to complete their particular trade portion of your project. Weather can also play a factor in the timeline of a project. Due to Florida’s unpredictable weather patterns, we ask that you keep this in mind. While we work to complete phases in a timely manner, our crews are at the mercy of the weather to complete their tasks at hand. One of the ways we make projects with Just Grillin Outdoor Living enjoyable is that updates are readily available at your fingertips. Our secure project management software allows you to follow along every step of the way without having to call. The software is updated on a weekly basis. Upon completion of your project, your project manager will schedule a final walkthrough. Generally, this is 2 weeks after completion so you have time to get acclimated to your project and gather any notes you might have. This way you’re 100% happy with our work. Our primary goal is to take care of you and make sure your project is to your liking. In doing so, we hope that we’ve earned your recommendation and confidence to refer us to neighbors, family and friends interested in similar projects. We have a referral program in place that we will send you a reward to thank you if one of your friends give us the opportunity to complete an outdoor project for them.